How to Replace iPhone 7/7Plus Screen? 1. Power off the iPhone 7/iPhone 7 Plus. 2. At the bottom of the phone locate the two pentalobe screws and remove using an screwdriver. 3. Place a suction cup directly on the display, above the Home button and gently try to remove from the rear casing. 4. If necessary, use a wedging device to carefully break the seal of the adhesive and pry the display from the rear casing. 5. Open the iPhone 7. 6. Remove the four, tri-point screws to free the display plate. 7. Use phone repair tweezers to lift the display plate away. 8. Then, use your wedging or spudger tool to pop off the three LCD connecting cable strips. 9. Unscrew two more tri-point screws at the top, right-hand corner that hold down your proximity sensor. 10. Remove the plate over the proximity sensor reveal one more cable strip that, when disconnected, will free the front display from the back of the phone. 11. Remove the three Phillips-head screws from the bracket behind the ear speaker at the top of the display side. 12. The bracket will pull away revealing the iPhone's camera. 13. Pull back the camera to remove the two screws holding in the ear speaker assembly. Lift the ear speaker out. 14. Gently wiggle and pull up on the proximity sensor to remove it. 15. At the bottom of the display side, locate the touch ID assembly. 16. Unscrew the four tri-point screws holding down the bracket. 18. Gently wiggle to remove touch ID, which will slide out the front. 19. Then remove the LCD back-plate by unscrewing six, tri-point screws. 20. Using your wedging or spudger tool, lift up the LCD back-plate to reveal the cable strip connected to back-plate. 21. Once you free the LCD back-plate of the cable, it should disconnect easily. 22. 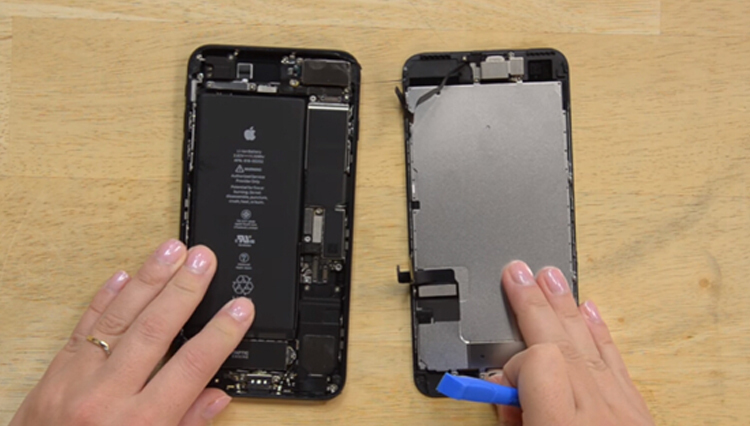 Discard your old, damaged LCD and replace with the new screen, folding down your cables and lining up the side mounts, to put the 6 screws back into place.